Following Canelo Alvarez’s destruction of Rocky Fielding at Madison Square Garden, Oscar De La Hoya took the podium in the media area assembled in the hallways beyond the locker rooms. Typically, when Oscar, or any authority figure, steps up to the dais, reporters dutifully fall silent and point their cameras or audio recorders accordingly. 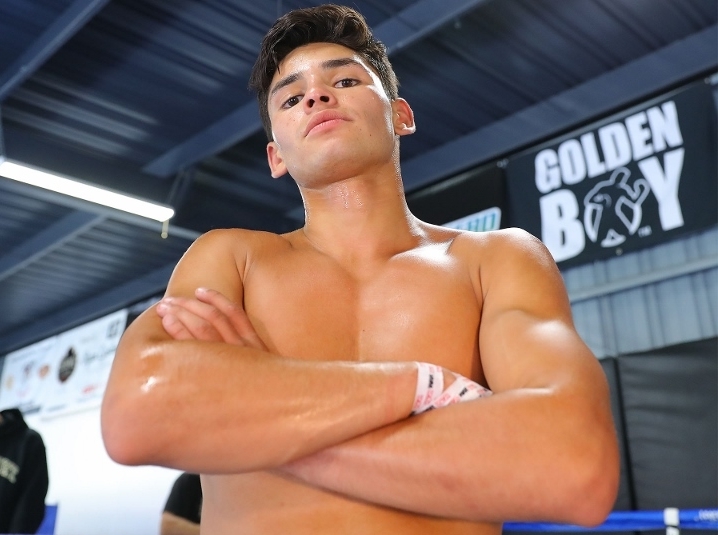 The only problem this time is that Ryan Garcia, who hours earlier had dispatched of Braulio Rodriguez, happened to walk into the area at the same time. Almost instantly, the swarm of journalists, hangers on and those somewhere in between flocked to the left of the stage and formed a scrum around Garcia. Media relations representatives tried to quiet down the flock, but it was too late. In a media world dominated by the currency of metrics and clicks, those who were a part of that economy knew exactly where their numbers would come from that night. Garcia looks like the love interest in a Disney show, and is acutely aware of where the cameras are and how to play to them. Before he arrived at the media gathering, he went back out to ringside to snap a photo with the Jonas Brothers. Ringside is usually a safe space for even the most famous, as guarded from the selfie hounds and autograph seekers as they want to be. But even Nick and Joe Jonas, who were quickly escorted out of the arena after the main event ended, deemed it important enough to take a pic with Garcia. Garcia, who returns to action this Saturday on DAZN against Jose Lopez, is more than just boxing famous. In fact, he may be more famous outside of boxing than he is within it. When he’s not in the squared circle, he’s creating “content,” the catch-all term for sharing media across various social platforms, ostensibly with the hopes of monetizing it either directly or indirectly. Garcia, frankly, has enough of a social media following that he could get rich through unboxing new electronics releases, live-streaming himself playing video games or hawking weight loss teas. With over 2.2 million Instagram followers and a substantial YouTube audience that peaks in the high six figures, most of his day-to-day musings are consumed more widely than any of his fights have been. To put it in perspective, his Instagram following is greater than Deontay Wilder’s or Tyson Fury’s, and more than Errol Spence, Keith Thurman and Terence Crawford’s combined. The 20-year old Los Angeles native is the leader of a new generation of young stars who have leveraged internet fame to propel in-ring careers. In the past, it was enough to simply have a sparkling amateur career and let the boxing hype machine take it from there. But as the sport drifted from the daily sports pages and the lead segment on SportsCenter, parlaying amateur success into notoriety was no longer a guarantee. Even professional success no longer guarantees fame or riches or notoriety, or even a push from your own promoter. The first fighter to take note of this and do something about it was likely Adrien Broner, who to this day finds himself in big money fights well past the expiry date stamped on him by the boxing thinktank, simply because of the recognition created by his online and real-life exploits—which have unfortunately become increasingly problematic over the years. Garcia’s contemporary, Devin Haney, took the unique approach of sharing all of his sparring sessions and generating his own hype without having to wait for the next fight to come along. Garcia has the amateur credentials to be labeled “blue chip” on talent alone, having amassed 15 national titles in the unpaid ranks. He’s blindingly fast—sometimes performatively so—and his results so far suggest he has legitimate knockout power in his weight class. But talent and success aren’t necessarily the only tools needed to build a superstar. The sport has been trying to build the next Floyd Mayweather or Manny Pacquiao, but there is the distinct possibility that boxing’s next crossover star is being DIY’d somewhere far away from the boxing workship’s conveyor belt. Some rudimentary and admittedly oversimplified math shows the possibilities that exist with Garcia, should his rise continue. The most-watched non-PPV and non-terrestrial cable fights of the past ten years have peaked in the neighborhood of 2.2 million, but typically settle somewhere between 400,000 and 1.4 million depending on the night. This indicates that there is a “base” boxing audience that will watch mostly anything, a second subset that will watch when they deem it either important or convenient, and then a whole world of people who the sport would love to convince to tune in. Garcia’s Instagram numbers suggest that either every boxing fan is more interested in him than almost any other fighter alive, or, that he is tapping into a fanbase typically not reached by the boxing promotional machine, but clearly curious about the sport. Perhaps the elusive “general interest” audience boxing broadcasters covet are already watching, just in different ways. Putting Garcia in the main event on DAZN this weekend is hopefully the bridge for users from one app to another. Stardom in boxing has always been organic in the sense that fans can cheer for whoever they want, and if you don’t lose fights, you will at least receive chances in the spotlight until you do. However, boxing isn’t a pure meritocracy in terms of star-building. In that way, it’s far more like the music business than it is one of the four major sports. It can push popularity, and its major methods of doing so have typically either come through the manufacturing of unblemished records (“dominance”), or through something somewhere in between patriotism and outright jingoism, by pandering to specific ethnicities and nationalities based on the origins of the fighter. In Garcia, boxing has someone popular entirely in his own right, and on his own terms. He models for Abercrombie & Fitch and Teen Vogue, he acts in a popular YouTube sitcom “On The Ropes,” and generally has interests and friends outside of the boxing world. One might logically wonder why exactly he wants to box at all. Slumped on a leather sofa in a pair of basketball shorts and as is often the case with him, no shirt, Garcia pondered that very question out loud. Garcia could be famous doing anything, but only in boxing can he become infamous—a champion. [QUOTE=JeffHornSmiles;19614156]Dont fight it bro. [/QUOTE] lol lol I was thinking the same thing....He need to get out of the closet and become Shirtless Ryan's new Instagram favorite fan lol then the confusion may go away.